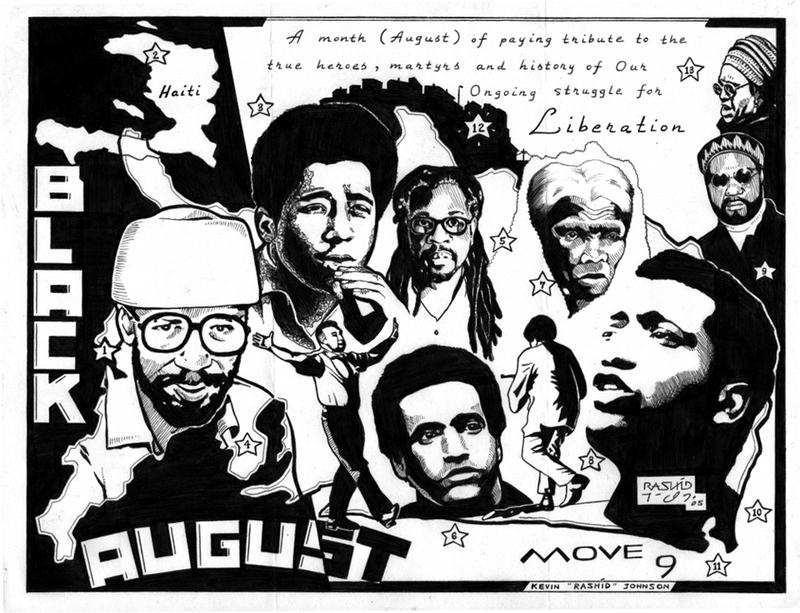 Black August originated in the concentration camps of California to honor fallen Freedom Fighters, Jonathan Jackson, George Jackson, William Christmas, James McClain and Khatari Gaulden. Jonathan Jackson was gunned down outside the Marin County California courthouse on August 7, 1970 as he attempted to liberate three imprisoned Black Liberation Fighters: James McClain, William Christmas and Ruchell Magee. The first Afrikans were brought to Jamestown as slaves in August of 1619. Gabriel Prosser’s slave rebellion occurred on August 30th, 1800. The “Prophet” Nat Turner planned and executed a slave rebellion that commenced on August 21, 1831. In 1843, Henry Highland Garnett called a general slave strike on August 22. The Underground Railroad was started on August 2, 1850. The Watts rebellions were in August of 1965. On August 18, 1971 the Provisional Government of the Republic of New Afrika (RNA) was raided by Mississippi police and FBI agents.